I’m looking for a DanDee COLLECTOR’S CHOICE white velour rabbit with pink velour ears, white hands and feet. 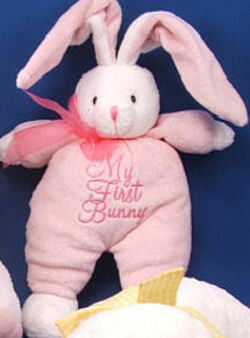 It’s wearing a pink sleeper that is embroidered with MY FIRST BUNNY, and it has a pink organdy bow at the neck. The ears have a stiffener in them. My 6 year old is very very attached to her first bunny, who may have to retire soon to over use. She literally does not go anywhere without it! I would really appreciate it if you can do a search for me. If you can help Judy find this DanDee Collector’s Choice White My First Bunny Rabbit Wearing a Pink Sleeper, THIS SITE IS NO LONGER ACTIVELY MANAGED. Please use Our FREE FACEBOOK GROUP, including the POST CODE #020910-1 , below the post. In case you are still looking for bunny.